This 3.7v battery charger is a unique product for hobbyists and is suitable for multi-types Li-Ion cells including 18650 (no PCB), 17670 and RCR123A (16340 ). The smart lithium-ion battery charger can be used worldwide with automatic cut-off and is perfect for any application that uses single Li-Ion cells. If you wish to charge an 18650 cell with PCB you must use charger CH-A1. Does not work with Streamlight or Surefire 18650 batteries. 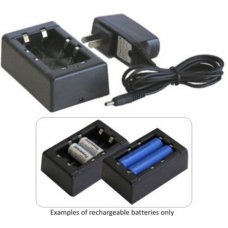 Charge 1 to 2 pcs 18650 (no PCB), 17670, 16340 (CR123A) 3.7V rechargeable Li-Ion batteries. Built in power adapter 100~~240V universal voltage, worldwide power support. Charges 3.7V Li-Ion rechargeable battery sizes 16340 (RCR123A), 18650, & 17670 only. Never charge primary Lithium (non-rechargeable) 16340 (CR123A), 186750, & 17670 cells. Don't open enclosure to prevent electric shock. Charger should be unplugged from the power socket if it is not used for an extended period of time. It is normal if the charger get slightly hot while using.